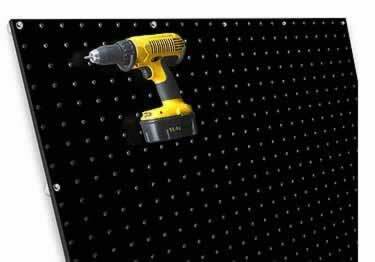 KSC Plastic Pegboards are constructed of the highest grade of polypropylene plastic that won't fade, dry out, crack or peel. These UVA safe pegboards are great for use indoors or outdoors to help you organize, display, and store just about anywhere. Comes in sizes: 2'x4', 2'x6', 2'x8', 2'x10', 4'x4', 4'x6', 4'x8', 4'x10' - All peg holes are 9/32"
How many wall fasteners do I need? How much weight does one peg board hold...regardless of the size of the board. I read that metal boards hold up to one ton.